She has grown up in Unterwasser. During her childhood, she already enjoyed taking piano and dulcimer lessons. Her first performances were with the “Starchebächler Husmusig”. Love led her to Appenzell, and now she works together with her husband who is involved with agricultural business. The two of them have three children. 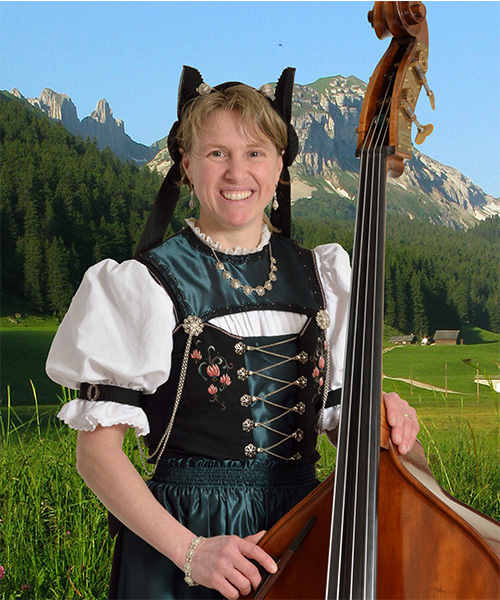 Kathrin, our bass player, and Silvia both come from Toggenburg. Kathrin started to play the contrabass for the first time at the age of 13. Since 2005 she has played at the Hölzler Striichmusig and since 2011 she has been playing at the chapel Alpstää-Nixe. In addition, she is pre-yodeler at the Yodel Club Ebnat-Kappel. Kathrin studied horticulture, but she is now working part time at a nursing home. 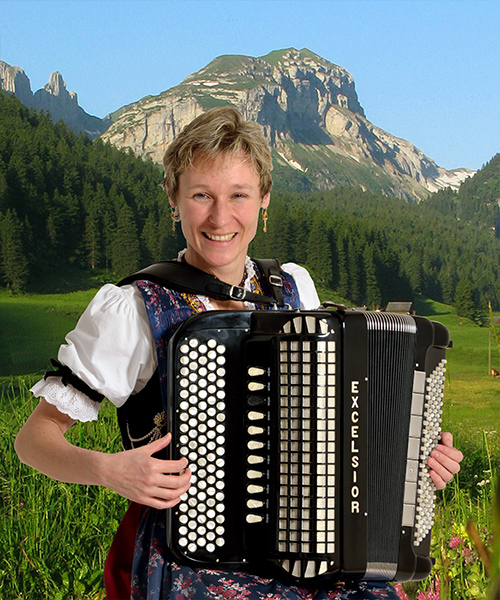 She leads a Swiss accordion store in Ebnat-Kappel with her husband and two children. 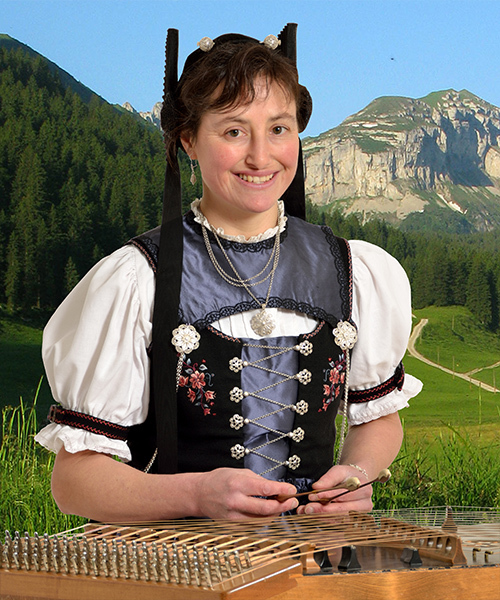 Madeleine Sager-Schläpfer; accordion & piano (dulcimer) Stettfurt, TG Our “Jodlerin” has grown up in Waldstatt and Herisau. As a child Madleine took piano lessons, and later on she started to play the accordion. The qualified kindergarten teacher sang for seven years in the “Saumchörli” in Herisau, for four years she was in the formation “Echo vom Tannenberg” and during twenty years she was active in the orchestra “Waldstättergruess” . Today she lives with her husband and two children in Stettfurt TG. Susanna has spent her childhood and youth in Urnäsch, AR. There she also took piano lessons. During her education at the teachers training college, Susanna started to learn bass. 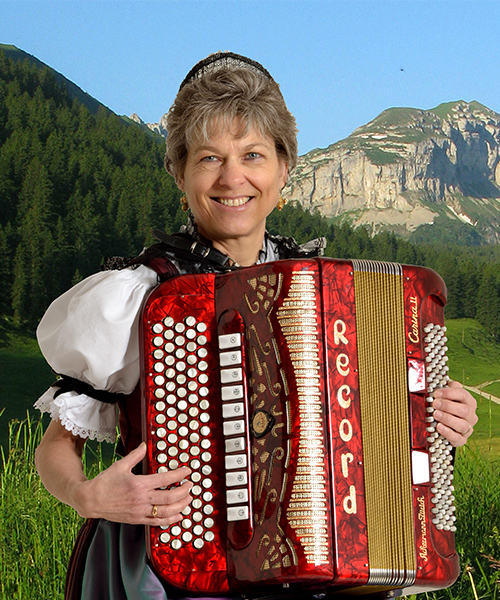 For ten years she played in the Appenzellerformation, “Trogner Föremusig”. At the age of twenty, she discovered her love for the accordion and took some lessons by Brigitte Schmid-Turrian. Susanna was one of the members establishing the "Frauestriichmusig", where she played for eleven years. Today she lives with her husband and three children at the foot of the Kronberg, where they manage a farm. Since 2003 the four of us are interpreting, cultivating, and swirling Appenzellermusik. During our performances we would like to show our love for folk music and provide enjoyment to our listeners.